I was able to talk with Kandice and Robert from Hy-Lyfe Family Cosplay. 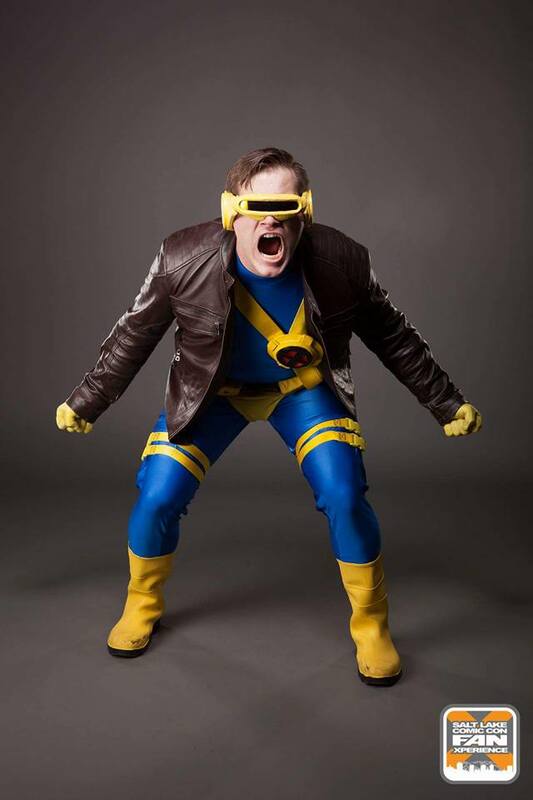 They have done some incredible cosplays, from Deadpool to X-Men. We discussed how they use their cosplay to bring smiles to others through charity and why cosplay is so fun! Q: Your whole family cosplays, how’d you all get into it? ROBERT: We all got into cosplay years ago. My wife has always been into it with her family. We were looking for something fun to do for Halloween and whatnot. Salt Lake Comic Con came to town and my wife wanted to go with me. She wanted me to dress up. 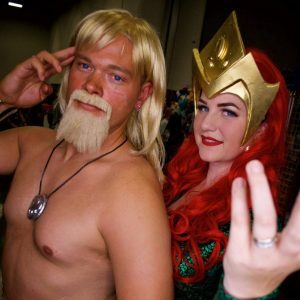 My response was “I’m okay with dressing up, but I’m not going to go halfway.” We had a really fun time, my wife and I going for the first time, and then we decided to go as a whole family for the FanX. The first time we went we decided to be the X-men family and we had so much fun doing that. KANDICE: My family is from Houston. And in the Houston area there is a thing called Dickens on the Strand in Galveston where you dress in Dickens’ era. My mom was a seamstress and she’d sew costumes for us. I won a dress competition from that, so we were used to dressing up and having people taking pictures of us and having fun with that. Comic Con came to Salt Lake so I asked Robert if he wanted to go to that. I thought it’d be fun and a different thing to do. He just wanted to go all out. I was actually a plus sized woman doing cosplay and you know, being a plus sized woman, if you do a good cosplay, you still have a lot of people who are kind and respectful. Because of cosplay, I lost a lot of weight. I lost 80 pounds because I had a goal of wanting to look better in cosplays and improve and it’s been a fun goal to have. We made really great friendships with doing cosplay. People I never thought I would’ve met otherwise, I‘ve been able to make really great relationships with. It’s also cool for our daughter who is 13 to do charity stuff as well. She is actually in National Junior Honors Society and she does that for some of her community service hours. Like next weekend, we’re going to do Toys for Tots and do service that way. We love it and it’s like an addiction where we are constantly getting new ones. Like Robert just got a fireman costume commissioned. It’s kind of like once you do it, you gotta have all your favorites. It’s like Pokemon, you gotta have them all! Q: What is your process for thinking of a cosplay and putting it together? ROBERT: Not anything deliberate. Just thinking of a particular thing that my wife or I felt we could do a job with or have fun with. KANDICE: Usually, we just throw around ideas between me and my husband. We like couple’s cosplays, so anything that we think would sound fun. And then we hop online and search what we can get that’s already made. Then we search for what we have to make ourselves. We YouTube it, Google it, do research, and put it together. Basically what we do is Robert is my support system and I do it, I just turn on my ACDC Pandora and rock on. I’ve got the heat gun and stuff like that and I’m cutting out worbla. 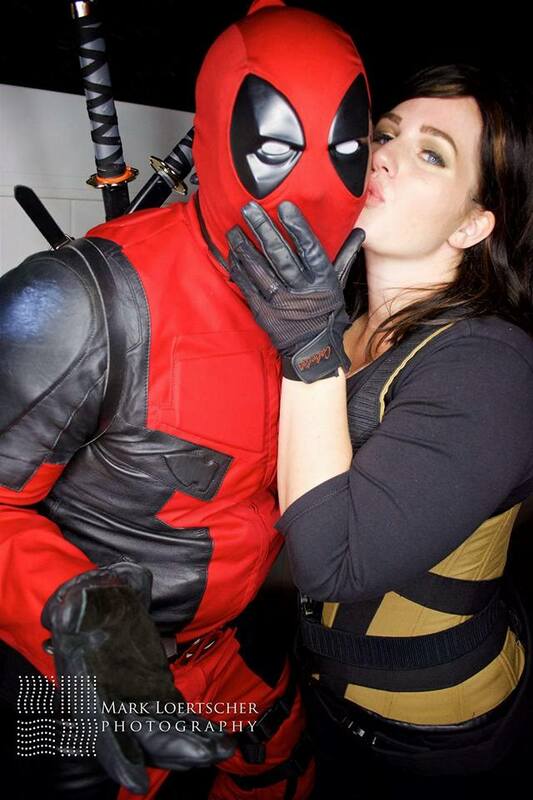 Robert and Kandice as Deadpool and Angel Dust.(Left.) Robert and Kandice as Aquaman and Mera. (Right.) Photo Credit Mark Loertscher Photography. Q: You do charity works and events. How’d you get into that? ROBERT: When we started going to Salt Lake Comic Con, we saw that there were some charity booths for cosplay and we had put so much effort into our costumes to make them nice we were also interested in doing charity for it. We inquired about it and found a local charity cosplay group and got into it. There are a lot of opportunities to cosplay for charities whether it be visiting a hospital or a lot of time we’ll raise money for different charity groups or houses like Make a Wish, Ronald McDonald’s House. We support other community and charity type of programs. Q: Do you have any memorable experiences doing your events? ROBERT: When we came to Salt Lake Comic Con, we also decided to dress up us as X-men and get pictures. I also got to meet one of the creators of Deadpool dressed as Deadpool. Kids would stop me and get pictures with me and he was very pleased with that. And things like that, meeting the creators of different characters seeing people pay homage to that and being really happy with that. This is something I’ve really enjoyed and continue to enjoy, and then of course doing charity and community events when a lot of times I get to be a different character, whether Spiderman or Deadpool. They don’t see me as a character-they see Spiderman is right there. KANDICE: There’s one where I was Red She-Hulk and the regular She-Hulk and I had like an epic battle at Comic Con. When my family won a costume contest, that was pretty fun too. Having my four year-old at the time, you know, she watched all the people going on stage and watched the cosplayers go on stage, and you know they had attitude and poses. And she watched and she was very observant. I was out in the audience because I was actually 9 months pregnant. And she walks up on stage like she’s a big hotshot, and like she already won it. Posed, popped up her hands. She was Rouge from X-Men. The whole ballroom erupted screaming. And then they won. And my kids were shocked that they won. They were already winners by getting onstage and having the confidence. Cosplay has been huge for my kids’ self-esteem. My 13 year-old says she really doesn’t care to be in the in crowd. She’s like, “I’d rather be weird and nerdy and have fun with what I do rather than being a mean girl, that’s no fun. I’m proud to be a nerd, mom, and I’m proud to do the stuff that we do and it makes me feel good.” It’s a proud mom moment when your kid shares your fandom and is proud to be like you and proud to make that decision and proud to want to help others and have fun. Q: Do you have a favorite cosplay? ROBERT: I think I wear my Deadpool a lot more. It’s a really easy one to wear and really recognizable one since the movie came out. It’s really fun to see people’s reactions. All the characters that we’ve done we’ve enjoyed and liked them for one reason or another. For example, I just put on my Cyclops and went to a symphony another day. We were invited to go to a Utah symphony for a superhero night. They had a bunch of scores from different superhero movies and Opera singers coming out and pretending they were super heroes. It was really enjoyable that the symphony organizers had found us and invited us to come out and interact with people in the lobby. Some of the other people from our group wanted to do a X-men theme. He wore Nightcrawler, I wore Cyclops. Wearing it reminded me how much I loved Cyclops. Although not as recognizable as Deadpool, still just as fun to do. Q: What is something you’ve learned from cosplay and doings these events and charities? ROBERT: One thing I’ve learned is you’re never too old for cosplay. As much as people might feel like they might be made fun of for cosplay, the community is very loving and kind. Of course there’s outliers, but for the most, it’s a very fun thing to be in. But also, you can see when you do a cosplay well and when you’re at an event or something, people are clamoring to get a picture and absolutely loving that you dressed up as a character. You feel like a celebrity just a little bit. It’s one of things that if somebody is thinking about getting into cosplay, put your doubts away and have fun with it and enjoy it. Really, you shouldn’t care about what other people think about it. You cosplay for you! Previous story Welcome to the World of Cosplay!